Harold Arlen biography, at the official website (click) haroldarlen.com It’s a beautifully done site, one of the more comprehensive and user friendly sites on Songbook composers that I’ve seen. 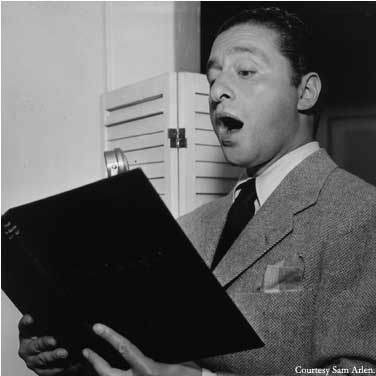 Post Script – Harold Arlen Who? 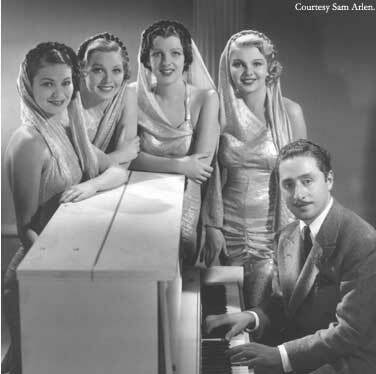 (left) Harold Arlen posing with models or showgirls. Anya Taranda, his future wife, is on the far right. They met on the set of Earl Carroll’s Vanities in 1932. 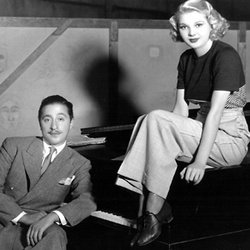 I don’t know if this photo was taken during that show — (right) Harold Arlen and Anya Taranda. 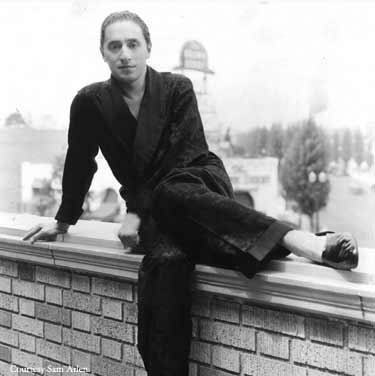 Also from the official Harold Arlen site: The songs…. 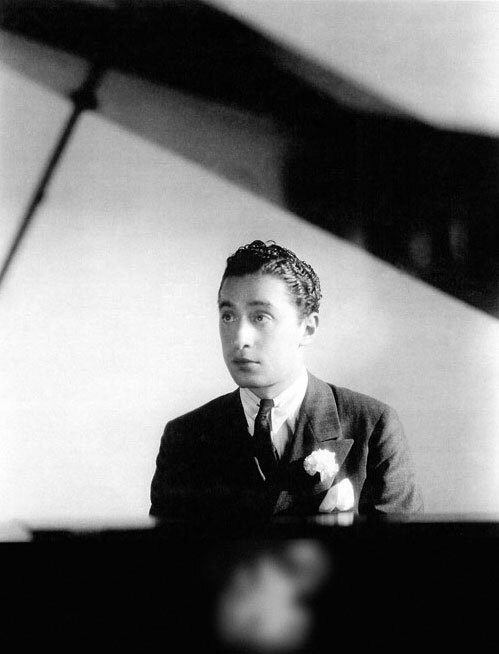 Harold Arlen wrote over 400 songs from 1924 through 1976. He worked with 31 different lyricists and composed scores for both Hollywood films and Broadway musicals. Find the song you’re looking for now! 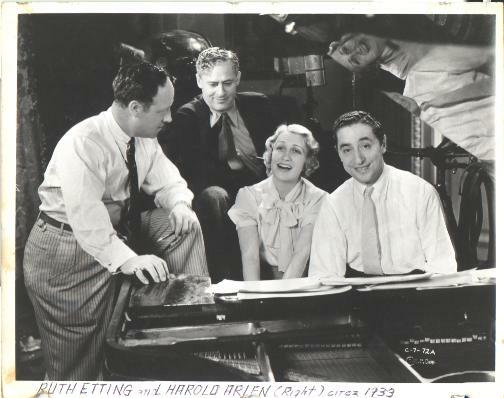 In 1929, Ruth Etting starred in Ruth Selwyn’s unsuccessful musical “Nine-Fifteen Revue” which closed in New York in less than a week; however, she did introduce Ted Koehler’s and Harold Arlen’s great song “Get Happy” which became one of her most famous hit records. 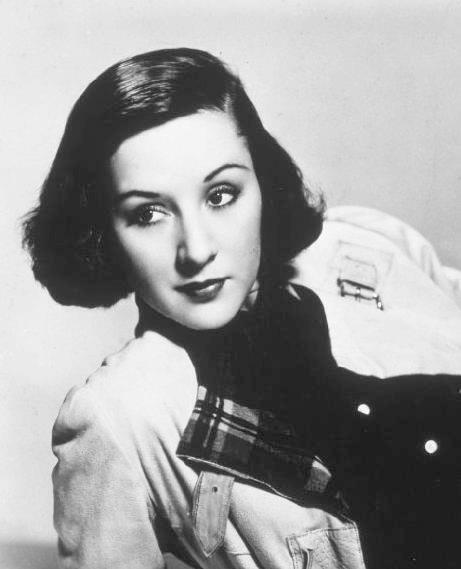 George Gershwin called her handling of the song the most exciting finale he had ever heard in a theatre. According to the “Song of the Week” article on the song at WICN.org, the song transformed Arlen from a singer into a songwriter. The number developed from a two-bar “pickup” vamp which Arlen created while working as a rehearsal pianist for the 1929 Broadway show Great Day!. He played it during rehearsals to signal dancers that a number would begin momentarily. The vamp developed over time into something more than a cue as Arlen, “fooling around” with the vamp, extended it and produced variations. He also reportedly worked on the theme during down time, improvising freely. Larry Clinton and his Orchestra featuring vocals by Bea Wain and Ford Leary, with the Philharmonicas, in the short film The Dipsy Doodler (1940). In this longer clip from the same episode the second number is As Long as He Needs Me (Lionel Bart), a song introduced in the 1960 musical Oliver!. 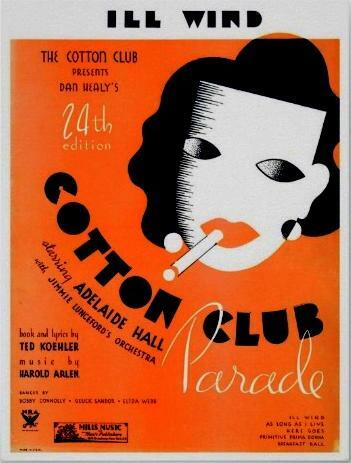 Between the Devil and the Deep Blue Sea (Harold Arlen, Ted Koehler) was written for the Cotton Club revue Rhyth-Mania which opened in March 1931. The song was introduced by vocalist Aida Ward. 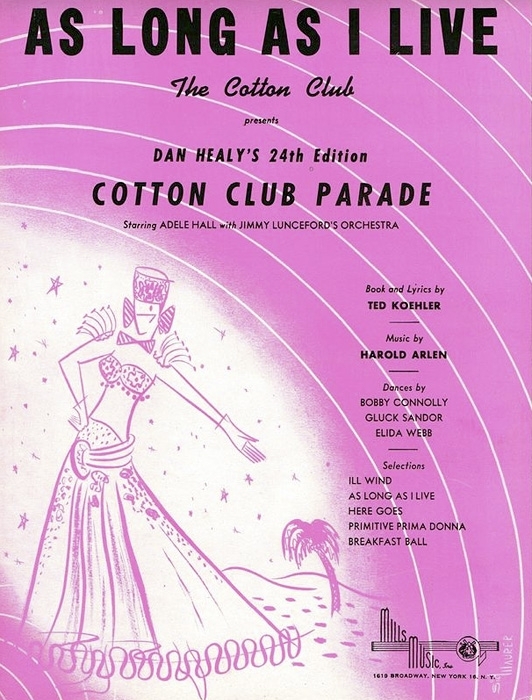 Cab Calloway and his Orchestra were featured in the Cotton Club production. Later that year they were the first to record the song. Note: The beginning of the track appears to be cut off, consequently the video is fifteen seconds shorter than the duration given at billieholidaysongs.com. 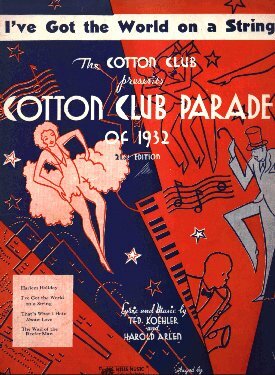 In the depths of the Great Depression one of the most aggressively cheerful of jazz standards made its debut: “I’ve Got the World on a String.” Harold Arlen and Ted Koehler wrote it for the Cotton Club Parade of 1932 revue. 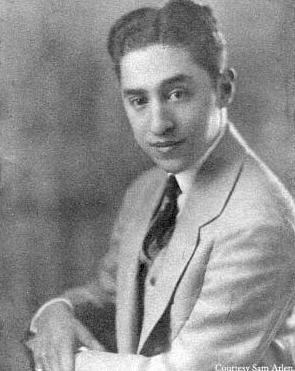 Allen Forte, in his book Listening to Classic American Popular Songs, said, “The mood of this joyous song stands in marked contrast to the situation that prevailed in the United States at the time it was composed and performed, a situation that affected almost everyone, excluding, perhaps, a select group that no doubt included the patrons of the Cotton Club and its proprietors.” From 1930 to 1934 Arlen and Koehler wrote songs for four revues at the Cotton Club, and each show had outstanding songs that went on to become hits, a remarkable achievement. 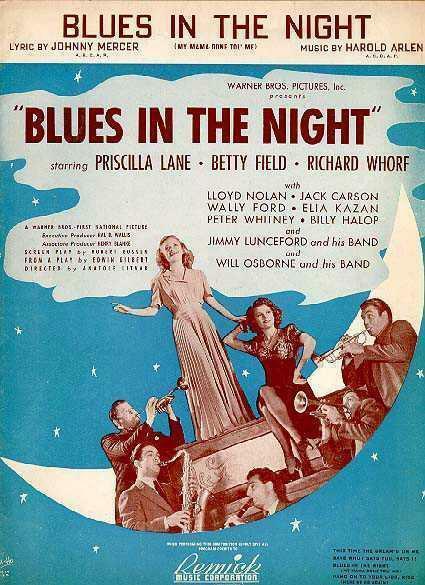 “Between the Devil and the Deep Blue Sea”, “I Love a Parade,” and “Stormy Weather” were among the several stellar songs they wrote for Cotton Club shows. 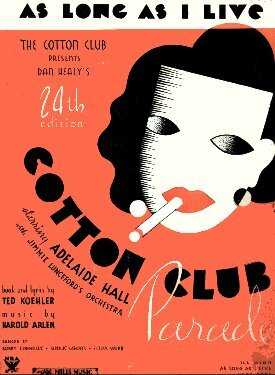 The Cotton Club did indeed seem to have “the world on a string” during the early years of the depression, but the repeal of Prohibition in 1933 and the increasingly visible poverty of Harlem eventually created insurmountable problems for it and other mob-run uptown clubs. The club moved to midtown Manhattan in 1936, but high midtown rents, the rising cost of elaborate floor shows, changing tastes in jazz, and renewed federal attention to income tax evasion among New York’s nightclubs caused the Cotton Club to close permanently in 1940. The Cotton Club boosted the careers of many black entertainers, including Ethel Waters, Lena Horne, Bill “Bojangles” Robinson and the bands of Duke Ellington, Cab Calloway and Jimmie Lunceford. 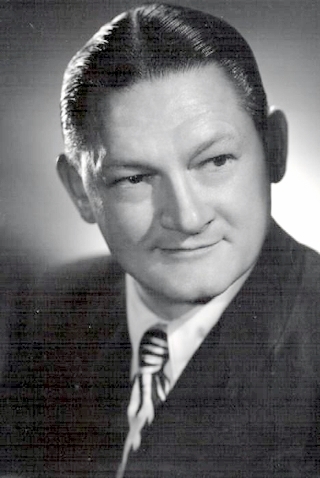 Calloway’s band was featured in the 1932 revue, and he was the first to record “I’ve Got the World on a String.” It rose to eighteenth on the pop charts that year. In 1933 a recording by Bing Crosby with the Dorsey Brothers’ Orchestra peaked at nineteenth place on the charts. 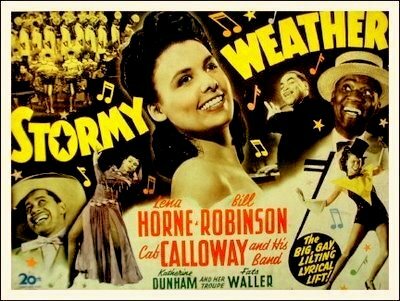 Louis Armstrong made a notable cover of the song that year as well. Later on, the song became associated with Frank Sinatra, and his 1953 recording with the Nelson Riddle Orchestra reached fourteenth place on the pop charts. 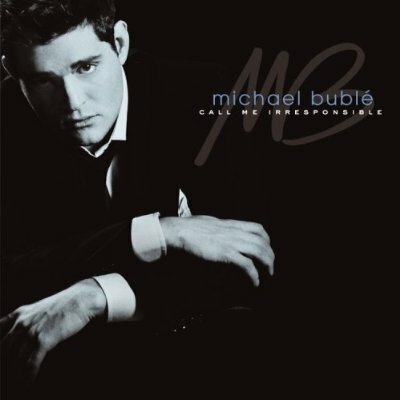 “I’ve Got the World on a String” continues to be recorded by a new generation of jazz musicians, including Michael Bublé, Diana Krall and Robin McKell. Peggy Lee – undated, 1950s ? another live performance, occasion unknown. Let’s Take a Walk Around the Block (Arlen, w. Ira Gershwin, Yip Harburg) was introduced in the musical Life Begins at 8:40, which opened on Broadway August 27, 1934. The following two songs are from the 1937 production Hooray for What! Barbara Streisand — Episode 9 of the Judy Garland Show, taped on October 4, 1963 and broadcast October 6.